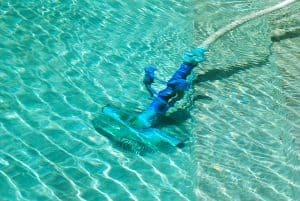 If the list of swimming pool maintenance tasks wasn’t already long enough, the temperature of your water is yet another factor you have to consider. In this article we’ll be taking a closer look at the best pool thermometers on the market to see which one ticks all the right boxes. We hand-picked the following pool thermometers based on their popularity, price-points and differentiating features. A more complete review of each can be found later in this article, or you can click here to jump straight to that section. 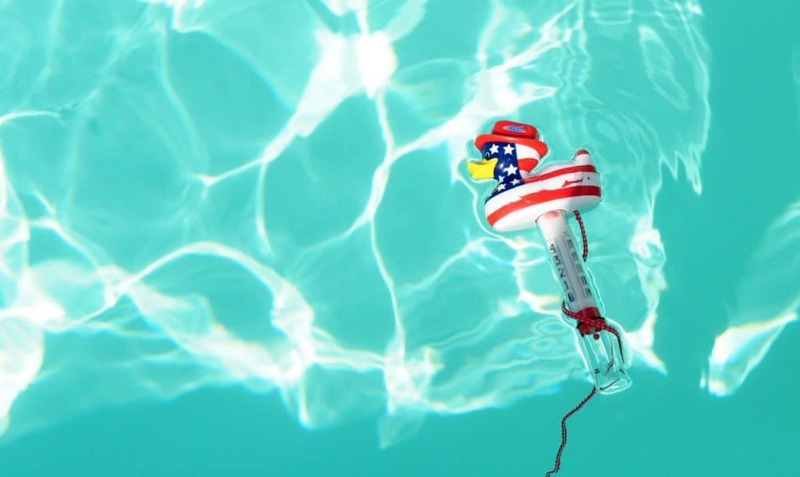 What Is A Pool Thermometer & Why Do You Need One? A pool thermometer is a small piece of equipment that allows you to measure the temperature of your pool water. Everyone has their own idea of what the perfect swimming pool temperature should be, with children being more sensitive to the cold, and adults leaning toward slightly cooler, more refreshing temps. This is especially the case for those who require a specific temperature, whether that be due to health reasons or simply to keep body temperature at a comfortable level outside of leisurely use. A thermometer allows you to measure and regulate the water temperature, which ultimately makes using your pool a more enjoyable experience. 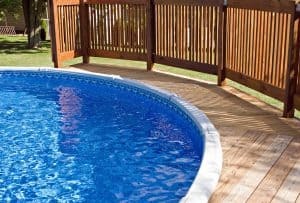 It’s also a helpful tool when determining the impact of your pool heater, whether there’s a technical issue, or if you even need to be running it at certain times of the year. It’s also worth noting that warmer pools tend to burn through their chlorine supply faster as well as breeds more bacteria, so keeping an eye on soaring temperatures has multiple benefits. 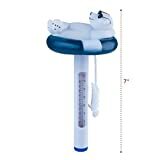 What Types Of Pool Thermometers Can You Buy? 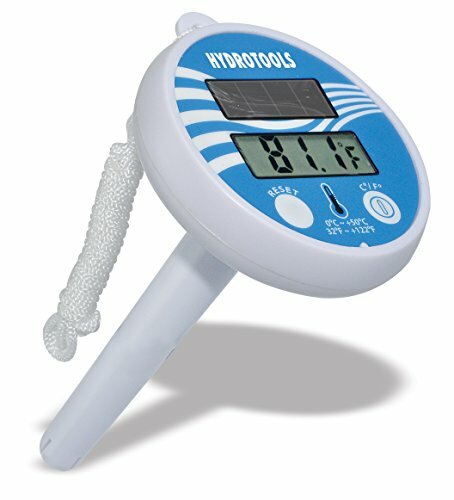 Swimming pool thermometers come in a variety of forms, each with their own unique features, build quality and vastly different price-points to boot. In this section, I’ll cover the different types of thermometers you can buy for your pool as well as the benefits and drawbacks of each. A digital pool thermometer uses a sensing probe which is submerged in the water, allowing it to relay a temperature reading to the display. 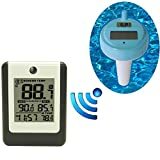 Most digital pool thermometers these days are wireless (sometimes referred to as remote pool thermometers), meaning they’re made up of two separate devices. The sensor, which stays in the water and wirelessly transmits temperature data to a receiver. The receiver, which then receives data from the sensor up to a certain distance from the water. This remote system typically runs on Bluetooth or WiFi, and some models have even started leveraging smart phone applications to turn your phone into a receiver. 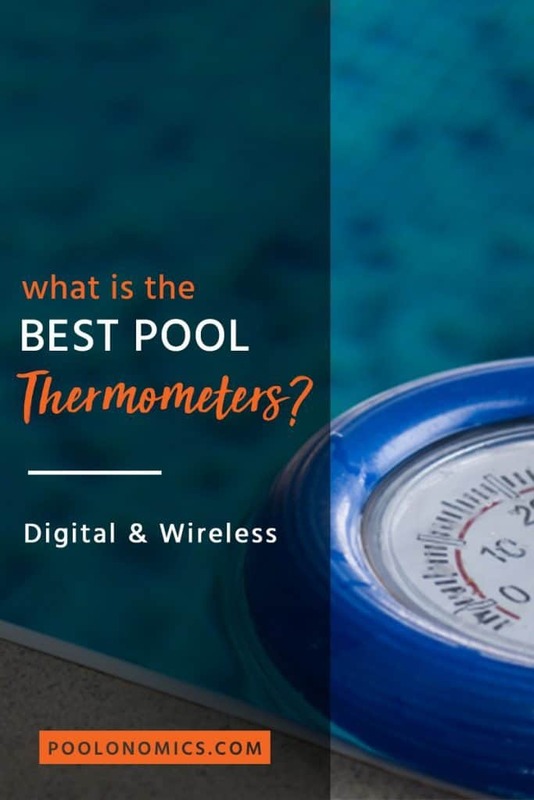 Digital pool thermometers are now the most popular (and most commonly sold) type used for testing pool water temperature, and this is particularly true for wireless variants. Analog thermometers look and behave like a traditional thermometer where the display is essentially a thin strip of plastic or glass, with mercury (or alcohol) rising to indicate the exact temperature. While these are cheaper and potentially longer-lasting, they’re not always as accurate as digital thermometers, not to mention they’re unable to leverage wireless technology — so the convenience factor is also missing. There’s certainly nothing wrong with using an analog thermometer, but most pool owners today prefer digital for the many advantages it offers compared to the old-school approach. Note — This guide primarily covers digital and wireless pool thermometers but I’ll include my top pick for those who wish to go the analog route. As noted above, the two core pool thermometer categories you’ll find on the market are digital, and analog — but there are still technically three “types” within those. Floating: Floating thermometers—or those that sit on the surface of the water—can be slightly less accurate since they aren’t properly submerged under water. Handheld: Handheld thermometers are either placed into the water temporarily (until an accurate reading is possible) or come in the form of a ‘point and shoot’ infrared laser. But Which Type Is Better? When it comes to choosing between digital and anolog, both types have been used successfully by pool owners for many years. The truth is, you can’t go wrong with either of them. For me, the fact that digital—and particularly wireless—thermometers are faster, more accurate, and frankly way more convenient than analog makes them the superior choice. As for the sub-types, if you’re going digital and you want the best possible experience, I’ve found point-and-shoot handhelds tick the most boxes, though this one seems to be more preferential. Knowing which type to look for will narrow down your options, but it doesn’t help you measure the nuances that make or break a product. Let’s go over some of the functions and features you should look out for when buying a pool thermometer. This is something you wouldn’t necessarily think of when buying a pool thermometer, since you would just expect it to have a readable display. Unfortunately, this can vary a lot from product-to-product, whether it’s the size of the display, the brightness (or backlight), or simply not your preferred unit of measurement. 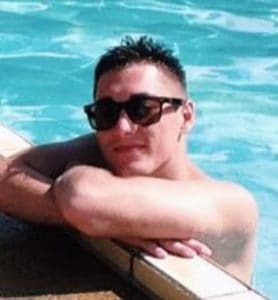 It’s also worth considering that standard, non-wireless pool thermometers will add another layer of difficulty here, since you have to physically go out to your pool and take a reading. How Accurate Is The Reading? Regardless of whether you opt for analog or digital thermometers, the accuracy of any device can be off by a small or even, in some cases, a large amount. While the overall quality of the product will contribute to the accuracy of your readings, it’s also worth considering things like the reading frequency, as well as the number of supported channels. Note — “Channels” are the number of sensors you can hook up to the receiver, allowing you to get an overall more accurate reading by measuring different areas of your pool water. What Distance Does It Work From? In the swimming pool thermometer world (granted, it’s a small world), the distance from the sensor at which you can get a reading of your pool’s temperature is called the “line of sight”. The line of sight can be anything from a few meters to hundreds of meters, so it’s important to understand what each product is capable of in this regard, especially if you intend to use it at longer distances. As you’ve probably gathered by now, this only relates to wireless, also sometimes referred to as remote pool thermometers. This is actually where analog pool thermometers get the (rare) upper hand, since they don’t need to rely on batteries in order to function. In any case, you’ll want to consider not only how many batteries it takes and how often you have to change them, but also the more practical issues like having a solid battery indicator/alarm. Durability is something I cover across most of my product reviews because, let’s face it, nobody wants to buy a crappy product that’ll need replacing in a few months. So how do you ensure you get a reliable digital pool thermometer? Brand: Buying into an established and trusted brand is the single best way to ensure you’re getting a quality product before you’ve had the chance to hold and test it yourself. Warranty: Not only is a longer warranty period a sign of confidence from the manufacturer, but it’s also something you should factor into your decision as even the best products can fail from time to time. So far we’ve covered what a pool thermometer is, why you need one, the different types available, and what features to look out for. In this section, we’ll be looking at specific products, each of which were hand-picked for review based on the same critirea I’ve outlined in this guide. The WS-14 is a digital, wireless pool thermometer from Ambient Weather. It floats on the surface of your pool, works with up to 8 connected devices and supports a reasonable line of sight up to 100 feet. The display is very clear, and can even be read from across the room, assuming you have at least a decent level of eye sight. One issue is that it doesn’t alert you when a signal drops between the sensor and the receiver, which means you could be getting an outdated reading and not even know it. The biggest complaint, however, would have to be the build quality. This seems to heavily debated among users, with some seeing several years of use from this device while others have barely gotten 3 months out of it. The MT6 is a digital, handheld infrared thermometer from Raytek. It uses a single dot laser system with a -30º to 500ºC temperature range, and it’s powered by a 9V alkaline battery which is included. Being laser-based, the Raytek offers extremely accurate temperature readings. And unlike other thermometers mentioned here, it works on just about any surface — not just the contents of your swimming pool. Some users report that it doesn’t quite reach the advertised distance, and also a pungent smell coming from the included carry-case. Pretty trivial stuff considering the overall quality of this product. 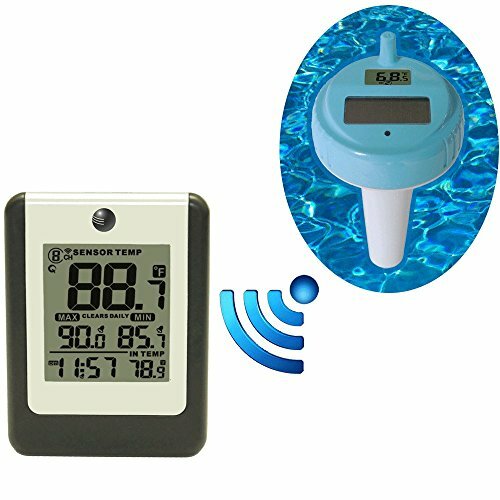 The HydroTools digital pool and spa thermometer from Swimline is non-wireless, solar-powered floating device for your pool. This one comes in at a more affordable price-point than most other thermometers on the market, and it boasts an easy-to-read LCD display for both celsius and fahrenheit readings. Despite a strong focus on the display aspect, many users report difficulty in reading it under bright conditions. Obviously this is not helpful during the summer when outdoor pools are being used most. If that wasn’t bad enough, people aren’t fond of the default unit of measurement being degrees celsius, especially since switching to fahrenheit can take several (fiddly) clicks to get to. The Milliard Floating Thermometer is, you guessed it, an analog, bear-inspired floating device that displays water temperature in both celsius and fahrenheit. Since this is an analog thermometer you won’t need to concern yourself with batteries, and it’s also available at a pretty modest price. Often times you do get what you pay for, however, and this one doesn’t come without issues. Many users have found either the floating part (the bear) comes lose from the actual thermometer, and the overall build quality is less than stellar. This type of thermometer also inherently lacks some of the more modern benefits, like a remote receiver or digital display. For me, after weighing up the best pool thermometer based on the different types, features and functions, there’s only one clear winner. That, of course, would have to be RayTek Infrared gun. It’s accurate, has a strong build quality, is convenient to use, and can easily be utilized in other scenarios outside of pool maintenance. If price is an issue, however, we recommend going with an analog pool thermometer instead. Despite grilling the Milliard Floating thermometer, it still gets the job done and won’t cost you an arm and a leg.